Please download the Work Order, fill out and return a in an email with artwork to info@darkhorseink.com. 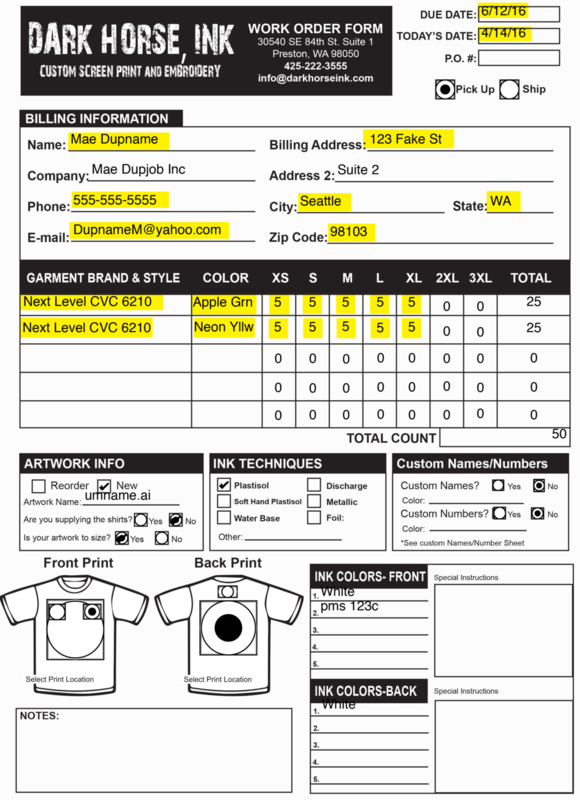 The work order form is made to make our printing process easy and accurate. If you are overwhelmed by this info don't be troubled. Email us at info@darkhorseink.com or call 425-222-3555 and we'll work through the Work Order together. Please fill out all of the basic info. Not sure what to do? Play the hits (highlighted). First, let us know if we've done this job before. Write down the file name from your artwork. Are you providing garments or do we need to order them? Is your artwork sized how you want it or should we size it? What type of ink are we using? If you don't know leave it blank and we'll talk about it. Does your job require custom names or number on the front or back? If yes, please fill out names and numbers list or provide one in the same format. Specify whether you want a left chest, right chest or full chest front or a small upper or full back. These are standard placements, if you're looking for a different location specify in the notes. Let us know what inks to use. If you know the pantone color please provide it. Understand that there can be a slight deviations in color when printing textiles.